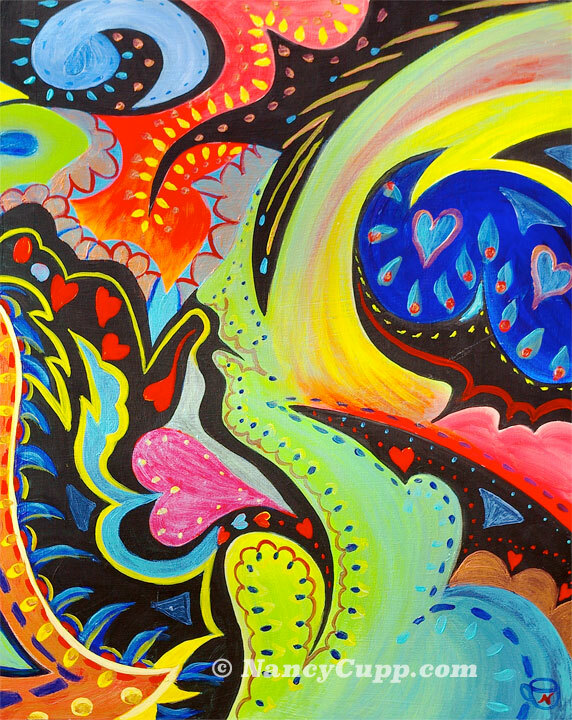 Vivid colors and shapes have always fascinated me as an artist. This is a conceptual painting of winding lines and colors dancing around shapes that may remind you of a lady's portrait, but full of passion, and mystique. Love can be elusive, something seemingly beyond reach. Can we be fulfilled when we find that special someone, or do they leave us bewildered, frustrated, and abandoned? Mankind is always searching for love, but usually in all the wrong places. Some are fortunate to find a wonderful mate to share their life with, but, even a wonderful mate can not fill that special longing for something more...and... there is something more. That "more" can only be filled when we find the source of all love, that power that created the universe itself. It is only found when we find the creator of Love. Not something that loves, but IS love. It is the greatest power in the universe. When you find Jesus, (Yeshua in Hebrew) you have found everything. 1 John 4:7 Beloved, let us love one another: for love is of God; and every one that loveth is born of God, and knoweth God. 8 He that loveth not knoweth not God; for GOD IS LOVE. 9 In this was manifested the love of God toward us, because that God sent his only begotten Son into the world, that we might live through him. 10 Herein is love, not that we loved God, but that he loved us, and sent his Son to be the propitiation for our sins. 11 Beloved, if God so loved us, we ought also to love one another.